Join the Galactic Tournament in this fast-paced comical action shooter. Level-up your Hero and unlock an arsenal of weapons. Lay waste to your friends and foes in local, LAN and online multiplayer matches, or hone your skills in single player and custom games. 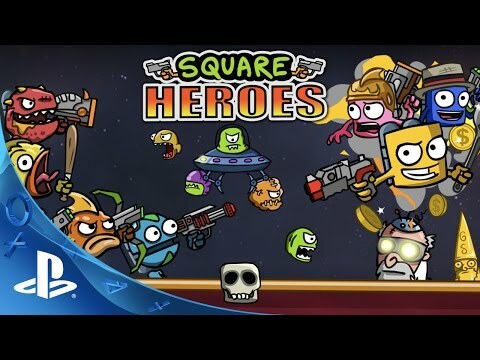 Square Heroes is a comical arena shooter featuring local and online multiplayer including PvP, Co-op and team based modes. Hone your skills and level-up your Hero in single player, or skip straight to the main event and challenge your friends in one of the hilarious and frantic online skirmish modes. All maps support six players including bots as desired. Local multi-player supports up to four human players and online battles allow up to six. What's more, multiple local players can join online matches together, enabling online couch vs couch gaming. 8 Game Modes: Deathmatch, Gnome Hunt, Last Alive, Kingslayer, Team Gnome Hunt, Team Deathmatch, Team Last Alive and Survival. 30 weapons to unlock including Grenade Launcher, proximity mines and Chicken! 30 Trophies to unlock, each of which awards a stat-buffing hat. Looks stylish whilst demolishing your foes! Unique gameplay mechanic whereby you unlock your chosen loadout during match.